Summary: World War II is raging, and Diana Hopkins, the 10-year-old daughter of Presidential advisor Harry Hopkins wants to do her part. Spying and trying to scare off enemies by sticking pins in the couch don’t work out too well, but she’s delighted when she overhears her father and Franklin Roosevelt talking about a new plan to encourage Americans to grow victory gardens. The first demonstration garden is to be planted right on the White House lawn. Diana teams up with First Lady Eleanor Roosevelt to create it. Before long, Diana is outside watering and weeding almost every day, and even gets her picture in the paper, standing in front of her thriving Victory Garden. On the last page, the Hopkinses and the Roosevelts sit down to a feast that includes beans, carrots, lettuce, and tomatoes from the new garden. Notes from both the author and illustrator give a bit more information about Diana Hopkins and Victory Gardens, and the research that went into the creation of the book. 44 pages; grades K-4. Pros: A nice bit of World War II historical fiction. Diana is a likeable character, with both a mischievous side and an admirable desire to contribute to the war effort. My mother, just a bit younger than Diana in 1940, would love this book. 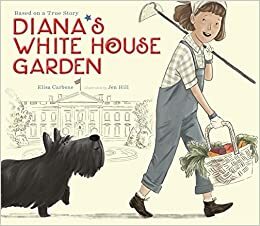 Cons: Diana’s life looks like it was a lot sadder than portrayed in this book…her mother died before this story takes place and her father, just a few years after.